This Friday I have three Fabergé objects for you! But even though they weren't really made to go together in a set, they fit very well together. The set consisting of three miniatures: a magnifying glass, a pencil and a patch box. They were created around the year 1900! The magnifying glass - only 2.7'' (6.9 cm) long - is made of glass, gold, and pale yellow enamel over a guilloché ground. The pencil was created by workmaster Karl Gustav Hjalmar Armfelt, and is only 1.7'' (4.2 cm) long. 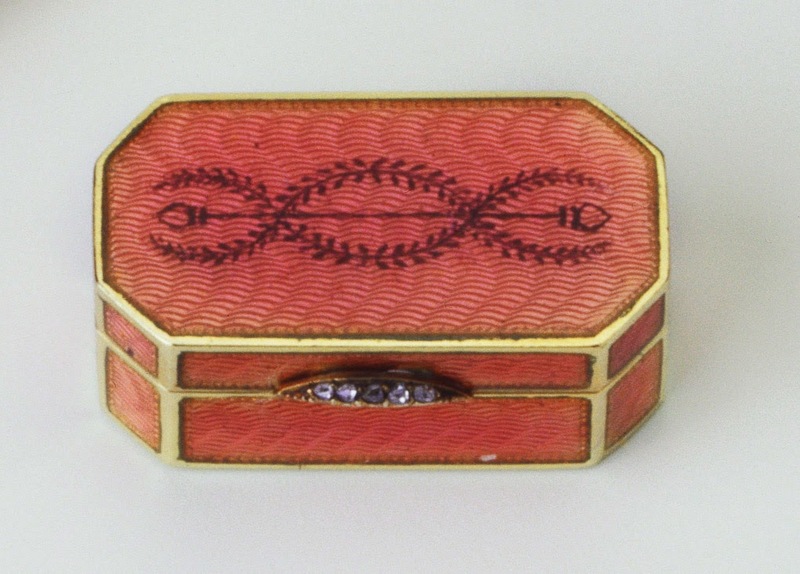 It is made of two-colored gold, with a holder covered in salmon pink enamel over a guilloché ground. It also has a gold hoop at the base. The third item is a miniature patch box with the dimensions 0.3'' x 0.8'' x 0.6'' (0.8 x 2.1 x 1.4 cm). It is also made of gold, covered in pink enamel over a guilloché ground. The lid is decorated with a sepia caduceus, and the thumbpiece is set with rose-cut diamonds. And here they are together. A very good example how good the quality and finish was even in Fabergé's smallest creations. They are now all part of the Royal Collection.